in England by Camille Pissarro. The history of Impressionism cannot be limited to a few public manifestations, nor even to the story of some exceptional individual careers. It is at the same time a propensity and a penchant which is established little by little, an upheaval suddenly accomplished and, beyond the changes that are apparent, of deep and lasting resonances whose nature is not generally recognised until years later. In the making of a rich tapestry the weft only begins to show clearly after the slow process of putting the multiple threads of the warp in place. 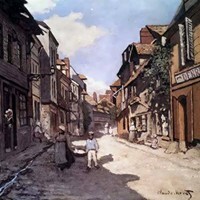 Except for Camille Pissarro, who was born in the West Indies in 1830, all the painters who form the Impressionist group were born within less than a decade, between 1832 and 1841.
and the French Barbizon School. hangs in the Musee d'Orsay Paris. The majority of them are Parisians and their families of the comfortably-off middle class: Edouard Manet (born 1832); Edgar Degas (1834); Alfred Sisley, of English parents (1839); Claude Monet (1840), although he passes his childhood and youth at Le Havre; and Armand Guillaumin (1841). Paul Cezanne (1839) comes from Provence, of remote Italian descent; Pierre-Auguste Renoir (1841), more modest, comes from Limoges, but comes to Paris in 1845; Frederic Bazille (1841) comes from Montpellier. Berthe Morisot (1841) is born at Bourges where her father is prefect. To these names may be added those of the Grenoble-born Henri Fantin-Latour (1836) and of the American James MacNeil Whistler (1834). To other generations belong Paul Gauguin (1848), Vincent Van Gogh (1853), Henri-Edmond Cross (1856), Georges Seurat (1859), Paul Signac (1863) and Henri de Toulouse-Lautrec (1864). It is also useful to go back several years to see where the men who have been associated with the beginnings of Impressionism and who foreshadowed or sensed its coming, began. They were born about or a little before 1820: Theodore Rousseau in 1812; Jean-Francois Millet in 1814, near the English channel; Charles-Francois Daubigny in 1817; the Dutchman Johan Barthold Jongkind in 1819, like Gustave Courbet from Ornans. Charles Baudelaire was born in 1821; Eugene-Louis Boudin in 1824, at Honfleur. Finally let us remember that Corot (1796) and Delacroix (1798) are of the previous century. Between one or another a series of meetings takes place, at first by chance or through connections, and soon the meetings are developed and organised. If the origin of most of these Impressionist painters is middle-class Parisian, giving them a view of the new society at a time when it assumes all the scope that Balzac wrote about, they also have sufficient links with the countryside in the harsh and noble work in the fields and with the great and natural forces of the forest and the sea for their art to become more vivid. Exoticism is not unknown to them either and, before finding a highly symbolic representation with Gauguin, offers them valuable sources. Delacroix had found an immemorable climate in North Africa which carried him above himself. We cannot fail to acknowledge the importance of the young Pissarro's visits to the West Indies which inspired his first works, or the voyage by Manet as naval apprentice to Brazil in 1849 (recalling the voyage of the young Baudelaire to the islands of the Indian Ocean in 1842), or the two years of military service in Algeria which Monet passed in 1861 and 1862 and of which he retained a wonderful memory, or the trip by Degas to New Orleans in 1872 to visit his mother's family. All these so widely different lives began to converge after 1850 when Manet, returning from his futile attempt to become a sailor, obtains permission from his parents to follow his artistic vocation and enters the studio of Thomas Couture in the rue de Laval. Teachers at the School of Fine Arts then had private studios which pupils could enter if they wanted exclusive training in a course. Couture, triumphant in the Salon of 1847 with his "Romans of the Decline," bulky, not without humour and a self-taught man who had established a successful practice, gave lessons that were essentially technical but not devoid of merit. He recommended, particularly, simplicity of tone and the use of pure colours without mixture. His disposition, soured by the rapid evolution of contemporary ideas, later was to lead him into coarse outbursts of bad temper where he displayed his jealousy, of Delacroix for example, and his hostility against all innovation; but he could not seriously claim to be dogmatic. Manet put up with him for six years having made clear at the outset his difference in conception, and established himself among his fellow students with authority and charm as leader and innovator. The date of the first meetings is 1855. At the great Universal Exhibition of Paris there is for the first time an important fine arts section in which 28 nations take part. "The three paintings by John Everett Millais are assuredly the most outstanding of the Universal Exhibition and it is impossible for even the most lackadaisical visitor not to stop there," writes Theophile Gautier in front of the English Pre-Raphaelites. There are also many German and Spanish painters present. The French contribution is considerable. Delacroix dominates the central hall with thirty-five paintings chosen from the most important of his production. Ingres has a room apart (indicative enough of his preference for isolation) with forty paintings and admirable drawings. Corot and Rousseau are well enough represented, and Daubigny, Jongkind and Millet figure with honour. In spite of the place occupied by painters of the Institute and the great number of medals they obtain (Couture, Gerome, Cabanel, Bouguereau and Meissonier), the independent painters and the different streams are equitably placed. Only Courbet is missing, having withdrawn because the jury rejected two of his paintings; but he has had his own personal pavilion, the" Pavilion of Realism", built at his own expense and there exhibits an impressive list of his works up to the quite recent synthesis, "l'Atelier" - "A real allegory marking a phase of seven years of artistic life". If the mass of the public were unaware of this exhibition, or did not bother with it, artists thronged there and Delacroix was seen there plunged in meditation. The old rivalry between Ingres and Delacroix now seemed to be quite finished. Each is wrapped up in his own ideas and devoted entirely to his art without being preoccupied by immediate influence. Ingres, although for thirty years a member of the Academy, has ceased to impose his exacting dictatorship; he has not exhibited at the Salon for a long time and, because of a poor reception accorded his "Saint Symphorien" in 1834, has ceased to sit on the jury. His work assumes new resonance and has something to please everybody. The young Edgar Degas, who has just given up law studies to devote himself to art and who is a profound admirer of Delacroix, equally worships Ingres, who has been introduced to him by M. Valpinyon, a banker friend of his father. Degas studies in the studio of one of Ingres's pupils, Louis Lamothe, before leaving for Italy to classical and primitive art from the originals. In the same year of 1855, Camille Pissarro arrives from the West Indies. He goes to Corot, who receives him in a friendly manner, and then enters his name at the School of Fine Arts, in the studio of Lehmann, another pupil of Ingres, but does not remain there long. James Whistler arrives, also via Le Havre, and enters the studio of Gleyre in 1856. In fact official teaching has become sclerotic and chaotic and is showing it. All the young painters who had no choice but to put their names down at the school get out quickly or, at least, reject its doctrinal mantle without scruple. All wonder about the new paths that have been opened up by men like Courbet and Corot. True values assert themselves and it is obvious that the problem of the day is that posed by Courbet and his writer friends. In 1856, Duranty launches the review "Realism." Discussions liven the cafes. At the Taranne may be found Fantin-Latour and his friends, at the Fleurus the pupils of Gleyre. But the real centre is the Brasserie des Martyrs where Courbet presides, surrounded by Baudelaire, Champfleury, Banville and Castagnary. The artists work willingly in the Louvre, studying examples of painting. Manet, Fantin-Latour and Whistler meet in these rooms, or in a free studio which has been opened on the Quai des Orfevres, the Academie Suisse, where they may find models without having to submit to correction. Fantin-Latour came from the studio of Lecoq de Boisbaudran, which encouraged its pupils to exercise their visual memory and seek in real life models for movement. In 1857, Manet visits Delacroix to ask permission to copy "Dante and Virgil in Hell," in the National Museum. But he is particularly inspired by the Venetians. "Little by little", notes Antonin Proust, "he would have suppressed the half-tones. The immediate passage from shade to light was his constant quest. In Titian, the luminous shadows enthused him." His copies are already transpositions where he applies himself to defining structures without lingering over useless nuances. However, the signs of novelty, the antidotes, multiplied. In 1856 the engraver Braquemond obtains Japanese Ukiyo-e woodblock prints by Hokusai (1760-1849) and soon opens a boutique in the rue de Rivoli with objects from the Far East, where the difference between Chinese and Japanese art can be learned. In 1857 Whistler goes to Manchester where fourteen Velazquez, genuine or believed real, are shown. The Louvre is not well endowed with the works of this painter; Manet has already copied one attributed to him. Shortly afterwards a Spanish ballet composed of singers and dancers arrives in Paris and he finds living inspiration in them. On a trip to Holland he copies Rembrandt. In 1859 all the young painters submit their works for the Paris Salon (which is held every two years). Manet's painting, "The Absinthe Drinker," is rejected despite the support of Delacroix. Fantin-Latour and Whistler, and even an acknowledged painter like Millet, are no more fortunate. Only Pissarro is accepted in the wake of Corot. The jury was so manifestly unjust that the painter Francois Bonvin, well-disposed towards the young, decides to exhibit some of the rejected paintings in his own studio. Courbet visits the studio and is very impressed by the works of Whistler and Fantin-Latour, whom he invites to come and see him. A young painter, Claude Monet, has just arrived in Paris to see the Salon of 1859. He has been a pupil in Le Havre, after a wild and vagabond childhood. Clever at drawing, he has made something of a name for himself by caricaturing local notables, until he becomes acquainted with Eugene Boudin. The latter has advised him politely to broaden the scope of his vision and discover the wonders of nature, the sky and the sea. Boudin was simplicity and sensitiveness itself - he submitted humbly to his impressions which brought him so much pleasure that he set about translating them with an attention to detail that sometimes led to a whittling down of the subject, but which always kept a freshness and a remarkable purity. At first a frame-maker, he had sold materials to passing painters, notably Troyon and Millet. He took their advice and kept in touch with them. 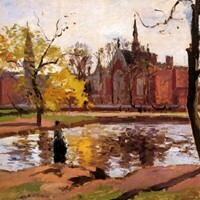 A city scholarship had allowed him to spend some time in Paris, but that had in no way changed his manner of working directly in the open air, according to elementary principles which he enunciated with clarity and good sense, and which could be summed up thus: submit to nature, follow one's first impression which is always the right one. Monet was soon captivated by the simplicity and good nature of the older man and felt singularly enriched in following his advice. "It was as if a veil had been torn aside. I had grasped what painting could be." Courbet, on a trip to Le Havre with his friend Schanne, in his turn discovers Boudin's seascapes. He becomes acquainted with the painter, who takes him to Saint-Simeon farm at Honfleur to admire the magnificent panorama of the Seine estuary. There they meet Baudelaire who also is enthusiastic about Boudin's work and adds a commentary to his Salon of 1859 to praise the" meteorological beauties" of Boudin's pastel work. At the Salon a wide-eyed Monet discovers the works of Daubigny, Corot, Rousseau and other giants of French painting. He finds the lessons of the Fine Arts School repugnant and prefers the Academie Suisse, where he meets Pissarro. He frequents the Brasserie des Martyrs and gradually becomes a part of the world of young painters. At the beginning of 1860 a private exhibition is opened in the Boulevard des Italiens of works by Delacroix, Corot, Courbet and the Barbizon painters, loaned by private collectors. It is a valuable example to all. As soon as the weather permits, Monet leaves for Champigny-sur-Marne to work in the open air. Pissarro also begins working on the outskirts of Paris. At the Academie Suisse he has met two newcomers, Cezanne and Guillaumin. The former, having studied law at Aix, has succeeded in joining his childhood friend Emile Zola in Paris and gets down very conscientiously to the work of preparing for his entry to the Fine Arts School. He is to be seen at the Academy every morning from six until eleven, shy and lonely, but remarkable for his determination and his vigorous execution. However, he fails to gain entry to the school and leaves discouraged to return to Aix and enter the family bank. Monet, for his part, is called up for military service. Having refused his family's offer to buy him out providing he returns to Le Havre, he leaves at his own request for Algeria. "You cannot imagine", he says one day, "how much I learned there and how my vision benefited. The impression of light and colours that I got down there could only be realised later, but the seeds of my future research were there." For more about the Impressionists attitude to light and colour, see: Characteristics of Impressionist Painting 1870-1910. In 1861, Delacroix completes the frescoes of Saint-Sulpice in which he uses big, separated strokes of the brush, which from a distance produce the effect of melting into one and give more strength and freshness to the fresco colours that always are a little dull. Fantin-Latour, who already has a considerable command of grey colours, comes to admire Delacroix's hatched nuances. Manet, on the other hand, leans towards painting of contrasts. At the Salon he exhibits the double portrait of his parents and the first of his Spanish themes, "The Guitarist." This time he wins honourable mention. His friendship with Baudelaire, whom he met at the house of Commandant Lejosne, becomes very close. It shows itself in concrete form in several ways: inspiration of the prose poem "The Rope", drawn from an incident in Manet's studio (the suicide of a youngster who had served as a model for "Child with Cherries"); and the quatrain written by Baudelaire under the portrait of Lola de Valence. In fact the whole of Manet's work in these years is projected in Baudelaire's writing. While the poet proclaims modernity of vision and substitution of present elements for the conventions of fiction, he quickly finds an echo, and what an echo, in Manet's painting. A direct affinity, an almost physical kinship is established between the writer and the painter, while Baudelaire's admiration for Delacroix remains on a purely intellectual level and the presence of Baudelaire in a work by Courbet remains accidental. NEXT: (3) The Impressionist Edouard Manet. Note: For details of the art critic who gave the Impressionists their name, please see: Louis Leroy (1812-1885). We gratefully acknowledge the use of an excerpt from Impressionism, by Jacques Lassaigne (1966).  For biographical details of one of Impressionism's greatest supporters, see: Paul Durand-Ruel.